I have another wonderful guest post for you from a blogging friend. This is part two of my series: Homeschool Reality Check. Today’s post is all about dealing with homeschool burnout. It’s something that all homeschool moms will face during the homeschool years. So, if you haven’t experience it yet, know that you will. But never fear! Here are some great tips to help you overcome burnout! Homeschool burnout is the real deal. You may feel it building and be ready for it to hit. Or it may blindside you and knock you on your rear end. No matter how it hits, homeschool burnout can rob you of your joy, peace, and love of homeschooling. And it doesn’t just affect your homeschool. Oh no! It creeps into every nook and cranny of your life. Because homeschooling is a lifestyle. Are you feeling the effects of homeschool burnout? 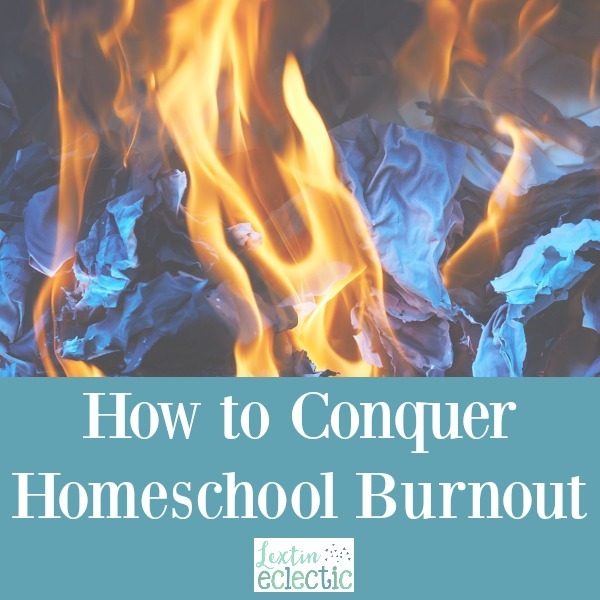 Check out these symptoms and then get tips on how you can conquer homeschool burnout. Homeschool burnout is not always obvious. Sometimes, subtle signs and symptoms can slip by or be easily explained away. Other times, you may be a walking model of homeschool burnout. What homeschool burnout symptoms would you add to this list? Is your homeschool curriculum the culprit? Does the thought of opening a specific math book or science kit make you cringe? Or maybe a schedule that is crammed with too many subjects and activities? If your answer is yes to either of these questions, then it is time to consider reassessing your curriculum and/or schedule. It’s okay to change homeschool curriculum. Or put it aside for a bit. It is also perfectly fine to cut out activities and subjects, even on a temporary basis. Your health and sanity are more important! Maybe things are a bit too serious in your homeschool? Too much work, not enough fun? If so, add somehomeschool fun! feel your homeschool burnout melt away with an injection of homeschool fun. Look at your homeschool planner. Have you been on a homeschooling streak? Maybe you need to take a break. Even a day or two can do wonders in helping you conquer homeschool burnout. Your homeschool will not be destroyed. Your kids will continue to learn and grow. And you can give yourself a pat on the shoulder for acknowledging the situation and doing something about it. Homeschool friends can bolster you when you are feeling burnt out. They get it. Your homeschool friends understand what it feels like to be with your kids 24/7 and to handle the pressure of homeschooling. Reach out to real life homeschool friends. And come and find us over at Rock Your Homeschool! Facebook group. Our community is growing and filled with wonderfully enthusiastic homeschoolers who are share, encourage, and support. I saved the most important tip for last. As a homeschool mom, it is essential that you make time for self-care. You must fill your own cup before you can pour into your kids. You CAN conquer homeschool burnout. Use these five tips and take time to hit the pause button. When you are ready to resume your homeschooling, you will find your energy and enthusiasm restored. What tips do you have to share to help conquer homeschool burnout? Amy Milcic is a soccer mom of 5 sons. She is also a homeschool mom and she shares tips to help you add sparkle and learning fun to your homeschool day. You can find her blogging at Rock Your Homeschool. What if You’re Not Excited for Back to Homeschool?